Today, I stumbled upon an ancient temple while exploring the neighborhood. 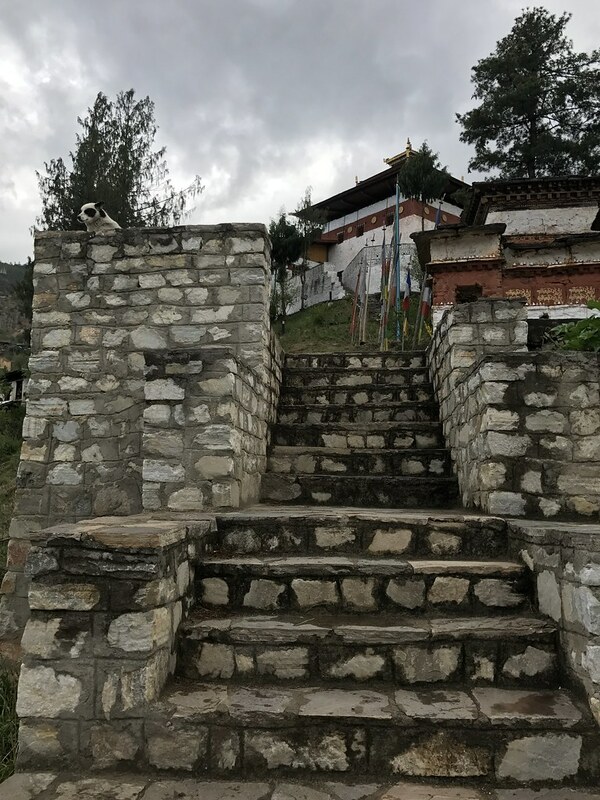 The site is perched up on an overlook like a fortress on a ridge above central Thimphu. The view of the valley was quite breath taking. It was slightly active with pilgrim activity. Circumambulation of temples and the turning of prayer wheels is an integral part of Bhuddism. Originally, established in the 12th century on a site chosen by Lama Phajo Drukgom Shigpo, who came from Ralung in Tibet. Today, parents traditionally visit the temple to get auspicious names for their newborns or blessings for their young children from the protector deity Tamdrin. Bhutanese people must wear their traditional dress in order to enter the Lakhang, an environment which was extremely spiritual and peaceful. The interior scenery and murals were particularly well conserved. Unfortunately, no photos are permitted. I did see some large 1 meter elephant ivory tusks and an assortment of musical instruments. A monk quietly was reading prayers while I took in the excellent view from the back kora (pilgrim path), with its lovely black-and-gold prayer wheels.